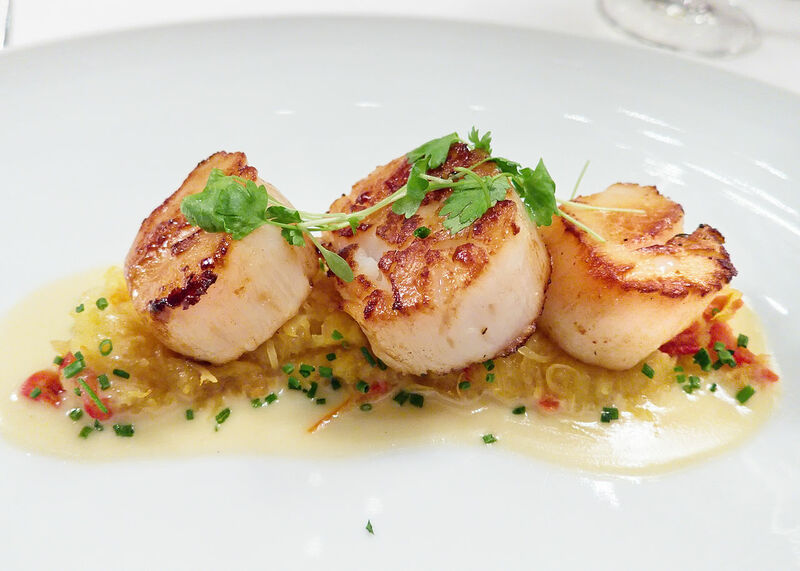 If you want to prepare a dish that combines both taste and elegance, you simply cannot go wrong with scallops! Sweet and creamy with a chewy texture, their mild flavour pairs beautifully with a sauce that is rich and buttery. Never cooked this divine shellfish before? Worry not – as top providers of seafood in Malta, we’ve shared a simple scallops recipe for beginners below. 1. You’ll need a large frying pan for this – preferably one that’s heavy based so that the heat is absorbed and distributed more evenly. Before going onto the next step, begin heating the oven to a temperature of 70°C. 2. Apply some cooking spray onto the surface along with some salt and pepper, and place the scallops in the pan. Allow them to sear for about 5 minutes over medium-high heat, waiting until they are browned. Cook for another 3 minutes, flipping them over with a pair of tongs or cooking pliers. Remove them from the pan, and leave them to warm in the oven. 3. Now for the sauce! Get rid of the brown bits at the bottom of the pan by using a wooden spoon. Add the white wine and the white onion together, allowing them to boil for 5 minutes. Adjust the temperature to a lower heat setting, and begin whisking in the butter gradually, adding one tablespoon at a time. Add salt and pepper to taste, and stir in the green onion and parsley. 4. Serve the scallops with the sauce. Bon appetit! Always try to buy dry scallops, as they tend to be free of chemical additives. They also have a purer flavour than wet ones and are darker in colour (usually more beige than white). If you have wet scallops, dry them out before searing by patting the outsides with a paper towel. Scallops can be kept in the fridge for a maximum of 2 days. Fresh scallops have a sweet, ocean smell; those that go bad will start emitting a strong, fishy odour. Azzopardi Fisheries: Your one stop shop for seafood in Malta! Whether it’s scallops you’re after or perhaps some premium quality mussels, we’ve got a mouth-watering array of seafood in Malta to tantalise your tastebuds. Head over to our store in St. Paul’s Bay to view our stock in person, or contact us here for more information. If you enjoyed this scallops recipe, have a look at our other blogs for more ideas! This entry was posted in News and tagged scallops, scallops recipe. Bookmark the permalink.